Jackfruit Tuna-Less Salad! It has the texture and the taste of tuna, without the actual fish. Delicious! One of the most charming and wonderful little wine and cheese shops you’ll ever visit just happens to be in my quaint little town. Might I be a bit biased? Yes, but I’m not playing favorites when I tell you how delicious their mayo-less tuna salad is. 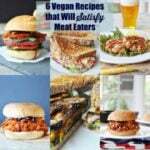 Before I went vegan I craved those sandwiches, and ate at least two a month. If I’m honest, which I always am, it’s the one food that I’ve missed over the past three years. 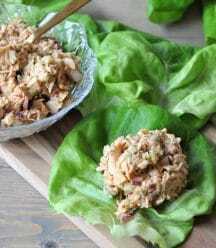 I made a “tuna” salad that was close in taste, this one, but the texture wasn’t spot on. 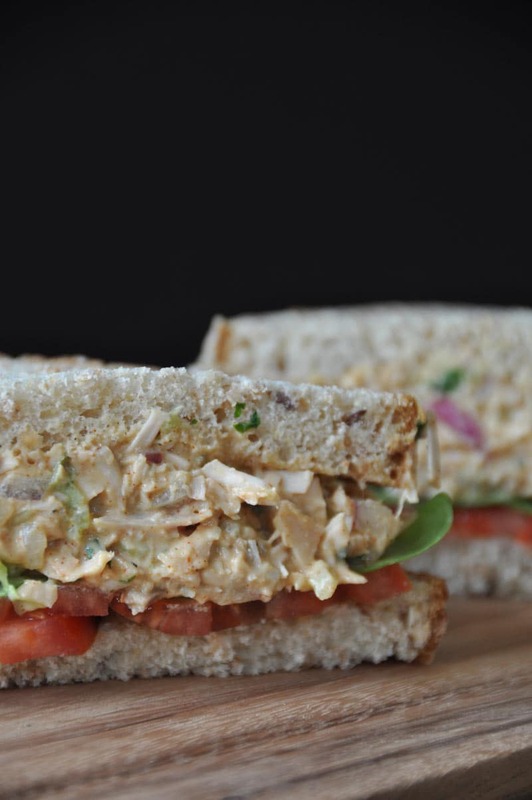 Why it took me so long to use jackfruit to make my favorite sandwich salad, I’ll never know. But I finally got a clue, and believe me when I say, I thought I was eating the real deal. If you’ve never tried jackfruit, you’re missing out. 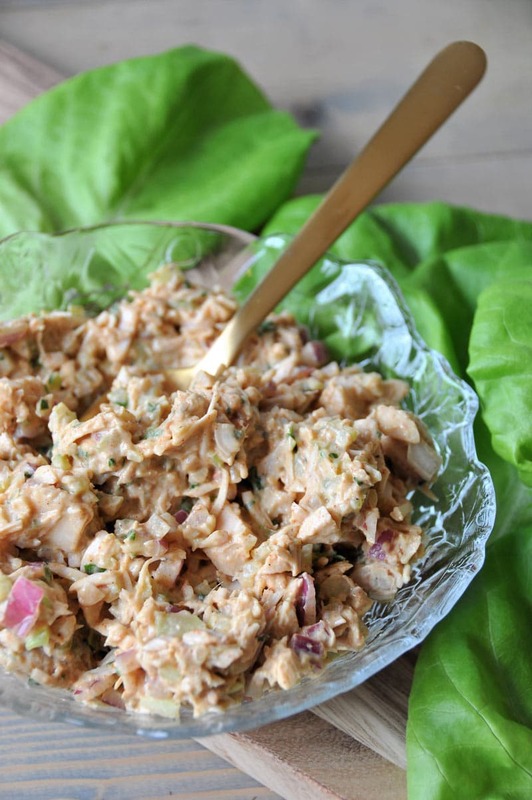 I’ll admit, it’s kind of odd on its own, but when it’s prepared like a pulled “pork” or a chikn’ chili, or, this delicious “tuna” salad, it’s incredibly, eerily, close to what I remember from my meat eating days. This recipe is mayonnaise free because my husband loathes it. He literally breaks out in a sweat and turns as white as a ghost, or mayo, if a food that’s coated in it is put in front of him. He’d argue that with me, but it’s true. After we got married I stopped eating it too, because I could never go through a jar of it on my own. That’s when tuna salad and I parted ways for a while, until I discovered the amazing salad at my local wine and cheese shop. Instead of using mayo to bind the ingredients together, they used Dijon mustard. Not only does it give the salad the creaminess that’s needed for this dish, it gives it a nice tanginess. 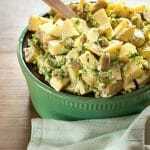 Rinse and drain the jackfruit, then shred it in a food processor until it resembles canned tuna fish. Add finely chopped celery, red onion, and parsley leaves. Stir in some Dijon mustard, unsweetened plain plant-based yogurt (I used Kite Hill’s almond yogurt), paprika, and salt and pepper to taste. That’s it, an easy to make, 7 ingredient, dairy-free and gluten-free tuna-less salad. 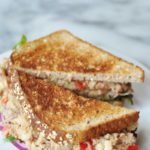 You can serve this mock tuna salad as a sandwich, on a lettuce leaf, in a scooped out avocado or tomato, or just eat it straight out of the bowl. Jackfruit isn’t easy find, so I order mine on Amazon by the case. You can make “chicken” chili with it, or “crab” cakes, or pulled “pork.” Use your imagination. A plant-based "tuna" salad that tastes and feels like the real thing. Drain and rinse the jackfruit and pulse in a food processor until it’s shredded and resembles canned tuna. If you don’t have a food processor you can chop it with a knife. Put the jackfruit in a medium mixing bowl and add the celery, onion, parsley mustard, yogurt, paprika, and salt and pepper and stir until it’s fully combined. Serve as is or as a sandwich. 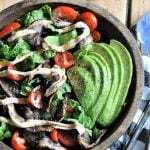 If you prefer your salad with mayonnaise you can add 3 tbsp (45 g) of vegan mayo and 1 tbsp (15 g) of Dijon mustard. Love your gorgeous photos that go with your recipes! I've tried to find canned jackfruit locally but I've been unsuccessful. When I lived in Sri Lanka I had a cook who used to make the best jackfruit curry for me from fresh jackfruit. Good lord it was good. It was my favorite meal that she'd make. Wish I'd asked her how to make it but I didn't ... sigh. Anywho, what brand do you buy on Amazon because I want to get the brand that you use as I can trust your judgement. I look forward to making this soon! It is a simple and good recipe. I will make it at this weekend. Thanks! You're welcome, Juanita. Thanks for letting me know. 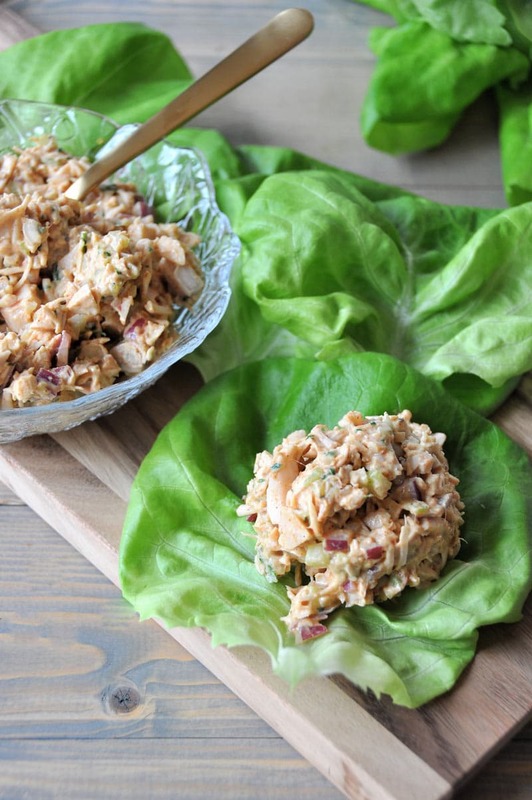 Holy jackfruit Linda, your tuna-less salad looks and sounds DELISH!! I would have never thought to use jackfruit this way. Your recipe is inspiring me to head over to Amazon and get a few cans immediately...my mom and I need this in our lives ASAP! Thanks for this awesome recipe! I use to love tuna salads too! When I want my fix now, I use a smashed chickpeas but you are right, its just not the same texture. I'll have to give jackfruit a try. Yum on this recipe, must try it. Thanks! I've never bought jackfruit in a can, but our local Whole Foods has been carrying fresh ones and they're crazy huge - wouldn't know what to do with it all! It does not take much time to do but still looks tasty. This will be my breakfast tomorrow. Thanks a lot. Lucky you! I wish I could find fresh jackfruit whenever I want it. I'm sure that it's so much better than canned. So glad to see such innovative recipes with the humble jackfruit. We had one in our backyard, back in India, while growing up and we used to make so many things with both raw and ripe jackfruit and even these seeds. This looks like a great recipe! Hey Howie! It's not easily found here, that's why I have to order it from Amazon.com. I hope someday I'll be able to find it fresh, as I've heard that it's so much better than canned. This recipe looks great! To help some people out, I thought I'd mention that trader Joe's carries jackfruit in a can now. Hey Sunshyne! Love the name! :) Yes, I just discovered that TJ's is now carrying jackfruit. Thank you, I'll update the post. Sounds like a great recipe. Can you use coconut yogurt instead of almond? Hi Katie! Thank you so much. You can, but it will change the flavor. I made this today and my jury is still out. I used vegan mayo because I love the mayo-y flavor in tuna salad. But something seemed flat. I put a sheet or nori in the coffee grinder and added that to give it some fishy flavor. It's better, but still just not right. I may stir in some garlic and/or onion powder for a little more kick. Or....suggestions? Thanks! Hi Suzy, did you add the mustard, or did you only use vegan mayo? The Dijon gives it a great flavor.